KATHMANDU, Mar 30: Minister of Culture, Tourism and Civil Aviation,Rabindra Adhikari, has unveiled a 100-day program which includes plans such as the upgradation of airport and making the Nepali aviation sector more effective. 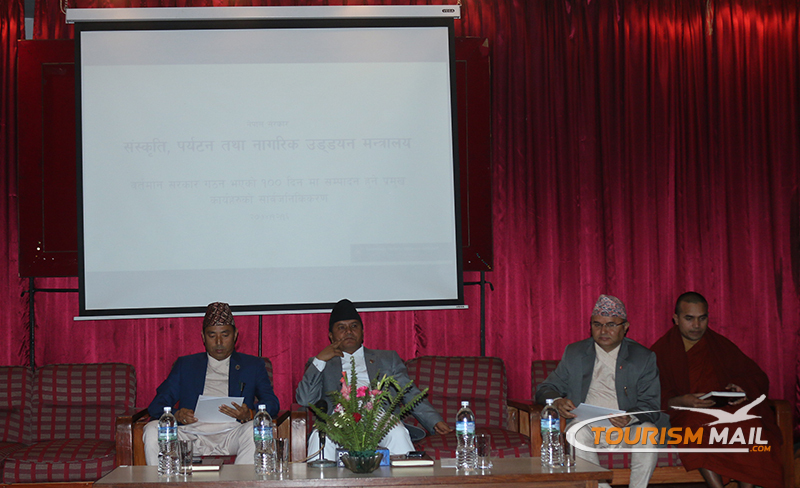 Minister Adhikari has announced plans to start operating the Tribhuvan International Airport for 21 hours a day. He has also promised to make the service more effective so that passengers can get their luggae within an hour. Alongside the improvement of TIA, Adhikari also said that he would get the environmental effect assessment of the second international airport at Nijgadh passed as soon as possible. According to him, the modality for the Nijgadh Airport will be finalized with Korean contractor company within 2 months. Adhikari has also committed to complete 40% construction of the Gautam Buddha International Airport and to appoint the supervision consultant for the Pokhara Regional International Airport within 100 days. He also said that having only one international airport and being forced to use the same runway for both domestic and international flights has increased the air traffic problems in recent days, and that a feasibility study for domestic flights will be concluded within 2 months' time. Minister Adhikari said that he will successfully complete feasibility studies for domestic airports in Dhulikhel, Kavre and other possible places within 2 months, adding that he will bring into operation all the existing airports in the country. Adhikari has similarly revealed many other plans which include changing the requirements for giving permissions to international airline companies to operate in Nepal, and to start the operation of the Nepal Airlines' A 330-200 aircraft and others in operation. He has committed to strengthen the flagship airline by using 6 of its 8 aircraft extensively to fill internal flights, and to start processes to purchase 6 new Twin Otter aircraft to expand its internal flights. Minister Rabindra Adhikari has said that he has publicized this 100-day program only after discussions with officials from the ministry, who have put the program within the realm of possibility and given full support to make it a success.